It’s also happening in the US, but it’s much worse in Canada. In the US, May industrial production dropped “unexpectedly,” as it was roundly called on Monday, by 0.2%, according to the Federal Reserve. The index value has now dropped from month to month since December, except in March when it was unchanged. The Empire State Manufacturing Survey, also released on Monday, confirmed this sort of scenario, ending up in the negative (-2.0) for the second time in three months. 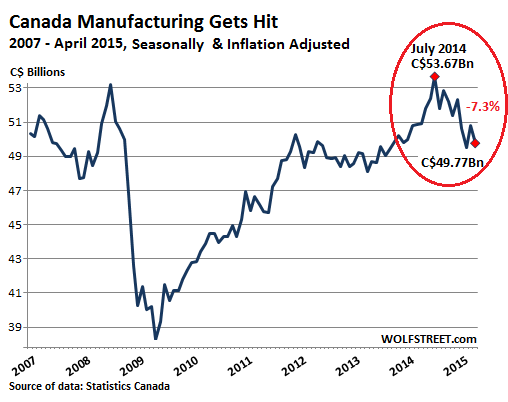 But in Canada, manufacturing is getting hit hard – and not just because of the oil bust, though it plays a big role. Originally the hope was that a lower Canadian dollar would boost manufacturing through increased exports. The loonie dropped 17% against the US dollar from January 2014 through mid-March 2015, though it has ticked up a smidgen since. But the theory didn’t work out. The biggest culprits in April were food (-5.7%), aerospace products and parts (-17.8%), petroleum and coal products (-2.7%), motor vehicles (-2.5%), and machinery (-2.7%). Of note, sales of machinery for the mining and oil & gas sectors plunged 30% year over year. Aerospace production dove 17.8% in April after soaring 40.1% in March (which had helped boost March into the positive). To smoothen out these monthly gyrations: in the three months ending in April, aerospace productions was down 13.7% from the prior three months, and at the lowest level since June 2014. Given the decline in sales, inventories have been piling up for the fourth month in a row. In April, they rose 0.8% to an all-time high of C$72.3 billion. Great, if sales had been rising along with it. But they declined. So the all-important inventory-to-sales ratio jumped from an already high 1.41 months in March to 1.45 months in April, the highest since July 2009, during the Financial Crisis. Over-optimistic executives expect sales to rise. They plan for it and order accordingly. If sales rise off the chart and draw down inventories, the inventories-to-sales ratio remains lean. That’s the rosy scenario. 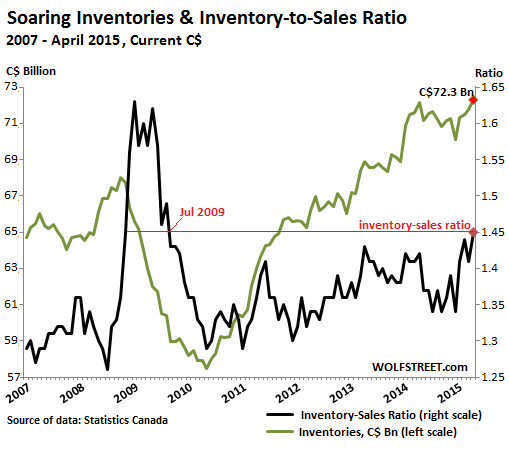 But that hasn’t been happening recently in Canada – or in the US, for that matter, where high inventory-to-sales ratios have also shot up, but not that far. It seems executives swallowed hook, line, and sinker the central-bank propaganda that global easy-money policies would get sales to rise, magically, and that escape velocity would solve all problems. But that hasn’t been happening anywhere. And then the oil bust hit Canada in the soft parts, and harder than it hit the US. From the business point of view, growing inventories and lagging sales can turn into a capital-intensive nightmare. Inventory is money. There are only two ways to bring inventories down: increase sales or cut back on orders. If businesses are not able to crank up sales across the entire country to bring down these inventories, they’ll trim their orders to suppliers, which tends to ricochet through the broader economy and trigger all kinds of secondary fireworks. Oh, and new orders fell 5.6% in April! While ballooning inventories add to GDP initially, the high inventory-to-sale ratio is a troubling sign for future orders and production. That these references to the Financial Crisis keep cropping up in official statistical data releases is chilling. Add to that the effect that decriminalized marijuana use in the US has had on MJ exports. At one time MJ was estimated to be one of the largest Canadian exports – up there with oil and timber. British Columbia alone was estimated to export $2 billion annually. Prices of MJ exports have dropped at least 50%. Aero-Space export sales, (Bombardier) is a sunset industry which is highly competetive and subsidized by governments, worldwide. If one accepts that industrial civilization is winding down due to these factors, and realizes climate changes everywhere are beginning to smack us around in a very worrying way, then one has to accept that the future will unfold in a very different way from what we are led to believe. We are getting poorer, in a real physical sense, and when the effects of this latest debt-fueled nonsense peters out people not making changes to their lives will be confused and angry about their failed and failing expectations. This ‘unfolding’ might not support $750,000 Toronto condos, or $500,000 (500 sq foot) Vancouver rabbit holes (False Creek), but the core strengths remain for those willing to change and work. The positives are as follows: Canada is truly self-suffucient in energy (unlike the US which still imports 40+% of energy). Canada has enough water and food production for its population. Canada has enough land for its small population and has resources of all kinds to keep these basics available for all. We also are a civil society with a rule-by-law mindset, and all firearms but long guns are restricted. (While this irritates rural me, nevertheless, it is better to restrict handguns and auto-matic weapons than allow their proliferation, despite ongoing Surrey drug war). Our single-payer medical system is already in place and health outcomes on average is quite high. Will some of these social programs have to be scaled back over time? Most likely. But I knew when I had my cancer surgery 5 years ago I was triaged into line for surgery as to need, and my bank account did not affect my place in order of care. I literally had no bill for surgery or medications including follow-up surveillance regimen. Let me re-phrase that, my bill has been paid in slightly higher taxation and on my bottles of Crown Royal. There will be re-adjustments in some industries, no doubt. There will have to be a re-thinking of expectations by all. But when I look at events unfolding across the globe I give thanks, everyday, to be living in Canada. We’ll be okay. We won’t be OK, but at -40, it will be quicker and more humane than in other places. Well thought out and well articulated comment. One problem with the analysis, I do not doubt that Canada is a highly civilized country; the problem is you live in the attic of one less civilized. Being an American descended from several who date back to before the Revolutionary War, I do not expect my countrymen to act honorably once they figure out that they have been hoodwinked by the corporatocracy. It is likely to get very ugly down here and spillover is highly likely. You may want to get busy building a wall. And I may want to get on your side it. We instead moved to the south island of new zealand. Much better climate very few people. And we were able to unload our kootenay property a couple of weeks ago. We are done with Canada and the 20 below weather. Speaking of marijuana, in the last year, there seems to be a major media push (tv,radio, internet sites) extolling the virtues of marijuana. None of the downside is mentioned in the U.S. press. The Pravda a “balanced” view? YOu have got to be kidding! The whole thing is one giant tabloid, a citidel of gross pseudoscience. The U.S. government has been lying about marijuana for decades and they arent slowing down. The problem with medical studies is most of them are worthless because of bad statistics. This is particularly true of studies on something controversial like where the political incentive to slant and bias the results is huge. And to find it in the Pravda of all places! This practically guarantees it is nonsense. I would suggest you not believe one lying word of that article. It is the old saw that when the USA catches a cold Canada gets pneumonia, excepting Canada has put most of its economic eggs in the tar sands basket and the price of oil has been cut in half. The other part of the equation is that the debt money system has reached a point of debt saturation and when the economy can’t expand in order to absorb new debt to pay off old debt economic dislocation begins to take over. This is when those in the know and on the inside like bankers withdraw from the system. The fact that the financial and corporate stalwarts of the international globalist corporatocracy have been looting main street the last four decades hasn’t helped. Only when enough citizens realize that the debt money system and fractional reserve banking practices is the driving force that has visited the four horsemen of the apocalypse on mankind the last three and a half centuries for its own advantages will things begin to change for the better. AWESOME movie. Totally educates anyone who watches. Well, now that they are calling up the men (probably women too, eventually) age 18-28 in the US for service (read, going to Ukraine, or fighting Russia & China,– guess what, we will LOSE) —-maybe, just maybe, Americans will wake up. It’s all about $ folks. Russia is going outside the dollar. China too. Better run the banks, just like the Greeks, everyone. Well put, Paulo. I disagree on the climate change claptrap, which is political and designed as all leftist propaganda is, to destroy free market capitalism (not the crony kind which stifles progress). The US could be energy independent if not bound up by bureaucracy that restricts our access to it. Geologically we are at the tail end of an interglacial period, and I’d worry more about the coming ice age than global warming, since the glaciers covered all of Canada and the northern US. Julian. I enjoy your posts and respect your opinion. But, I do have to disagree on your description of global warming as leftist propaganda. As a scientist, I approach science with an open mind and go where the data takes me. The only ones I know who cherry pick the data to lend credence to their claims are the ones at the Heartland Institute who are largely funded by the oil industry. There is little profit to be had if your work supports climate change. “Big Green” doesn’t pay nearly as well as the Koch Brothers and EXonMobile. That is based on personal knowledge and experience. My second point is that we do have a number of prominent climate change deniers in Congress. But, at the same time, the Pentagon has accepted climate change (global warming) and has determined strategic changes required to deal effectively with current and future consequences. The US Navy has already begun infrastructure programs to deal with sea level rise. And the Congress has funded these programs. So, on the one hand those who profit from the fossil fuel industries, deny global warming and man’s role in it, while on the other, those charged with our national defense and security accept the reality and move forward to mitigate the challenges. Ummmmm……. Do you happen to know the Eskimo word for “robin”. Well guess what, neither do the Eskimo but for the the first time in their history they are seeing them and need to come up with a word for them. You are right about the long term threat of a new Ice age but that is centuries off in the future after we finish burning up all the fossil fuels. Once that happens it will take the oceans about a century to absorb all the extra CO2, and world climates will start to cool… relentlessly. But in the meantime it is global warming we have to worry about and it could lead to economic chaos. Awesome movie!!! Educates anyone –Ending the Fed is the only answer. Interest free money- pays off the national debt in a year. Maybe now that they are calling up men 18-28 for service Americans will finally wake up. They’ll start with men and then get women too….to go to war with Russia, and we will lose. Hello, out there!!!???? This summer will be the RED LINE they like to talk about…..the Fed has destroyed America, compromised Canada, and destroyed Mexico. So, are we going to give up our young people to fight Soros war in Ukraine? The Bilderberg et al need to be put in their place for crimes against humanity.